In 2007 the completion date for the U2 Tower was due to be in late 2011. In 2008 the project was suspended due to the economic situation. 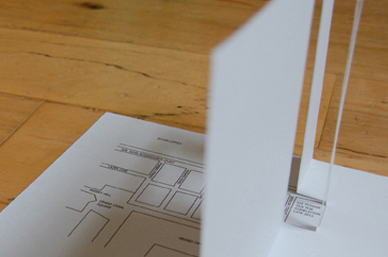 A paper pop-up version was designed to feature in the debut publication of Dublin based collaborative art magazine project Not Drowning but Waving, as a reminder of this ‘unbuilt’. Now existing only on paper, this cut-out serves as a kind of ‘anti-monument’.